A firm belief in the success of giving and sharing reinforced the launch of our company. We have built our organisation with this notion as a basis. Entrepreneurship demands passion, conviction and unswerving self belief. But above all it demands collaboration with your environment, co-creation and investment. Over the past decades we have become increasingly supportive of the Rijnland family run company. The ‘Rijnland’ adjective means we are convinced that entrepreneurship is about creation in a particular environment and where this environment comes first. Our maxim ‘family run company’ is proof positive of continuity and steadfastness, as well as clearly demonstrating that this company is not just about the bottom line. Over the last few years, our principal focus has been on guiding our organisation towards independence. Children grow up, find their feet, they become their own people; likewise companies and the people who work for them. We are now proud to be part of Wiertz Family. In Wiertz Family we fulfil our role as shareholders of Wiertz Company; we supervise and are – from a certain distance – available for advice and action whenever this is required. Within the scope of our expertise, we are also proud of the added advantage that Wiertz Company delivers to both man and employment. Our mission is accomplished every time a job seeker finds a new working environment and when an employer welcomes a new colleague. Our mission also includes helping start-up entrepreneurs, people and organisations innovate, collaborate and invest. We harbour a passion to be outstanding in this and to share our experience with others. After all, entrepreneurship is about sharing and giving. 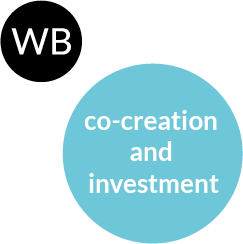 Wiertz Family is our joint activity and as it is all about co-creation, we have incorporated the letters WB into our icon as a co-reference to both our family names.